A growing number of people today adorn permanent tattoos inscribed over the skin using ink and needle. These tattoos come in different designs, shape and size; one of the most popular tattoo designs is the depiction of a tree with roots, branches and foliage. The tree occurs in the natural environment and is often used to symbolize life in most cultures. According to experts, trees are seen as long lasting and resilient living objects because they can live for many years and possess the strength to overcome storms and other elements. Trees also play a crucial medicinal and safety role as a cure and habitat for different creatures. The components used for medicinal value include the roots, bark, and leaves. 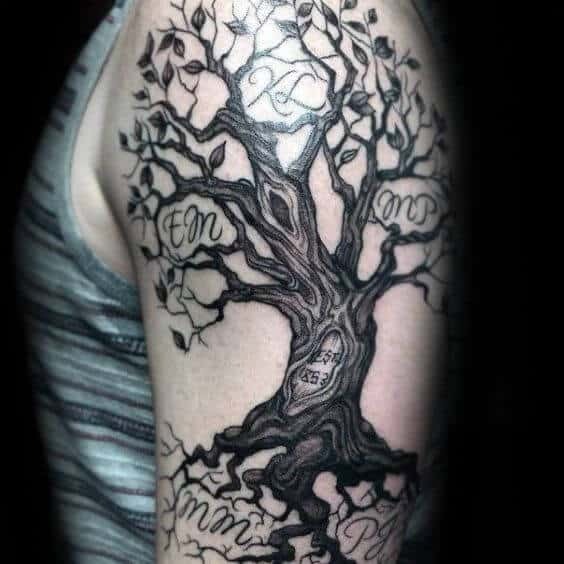 In the tattoo context, all the components of trees carry a different meaning. 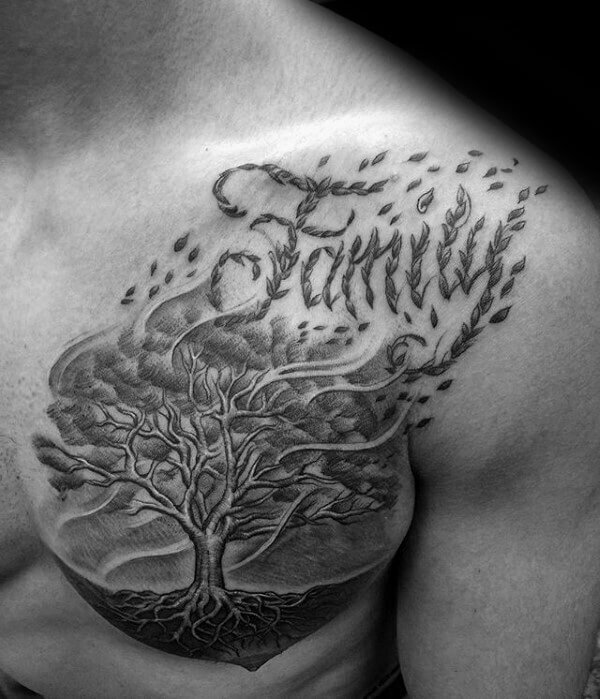 What Family Tree Tattoos for Men Symbolize? The roots symbolize a connection to the past, while leaves symbolize a number of things, including growth and rebirth. The leaves can also signify transient objects that come and go. Flowers on their part largely represent blossoming of a relationship or life or the womankind while the branches represent the push to reach out to the unknown. 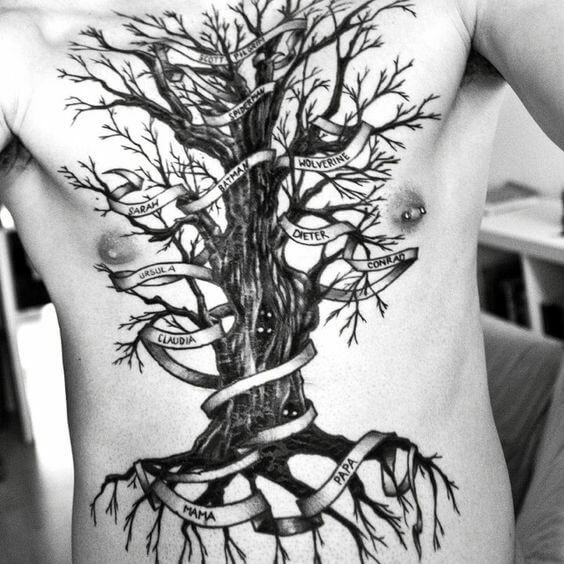 On the overall, tree tattoos represent the themes of life cycle, stages and seasons. The most commonly depicted trees include Apple trees, Cedar trees, Fig trees, Maple trees, Walnut trees, Elm trees and Cypress trees. The Cedar tree has been used for many centuries as a popular construction material. In certain cultures, the tree is considered sacred for cleansing rituals. However, in the world of tattoos, the Cedar tree tattoo demonstrates incorruptibility and protection. The Elm tree, on the other hand, symbolizes the individual commitment and dignity while most people use the Maples tree to symbolize balance, duty, and harmony. 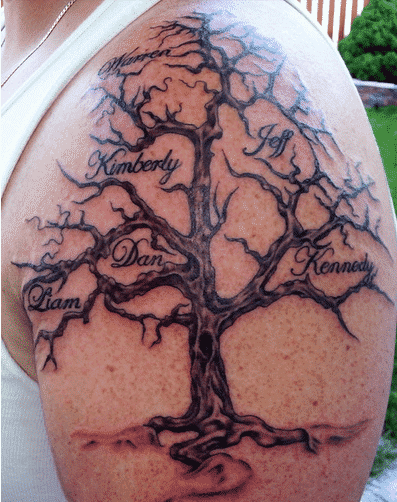 Family tree tattoos for men are a personal category tattoos that give men the opportunity to showcase their love, gratitude, and respect for their family. 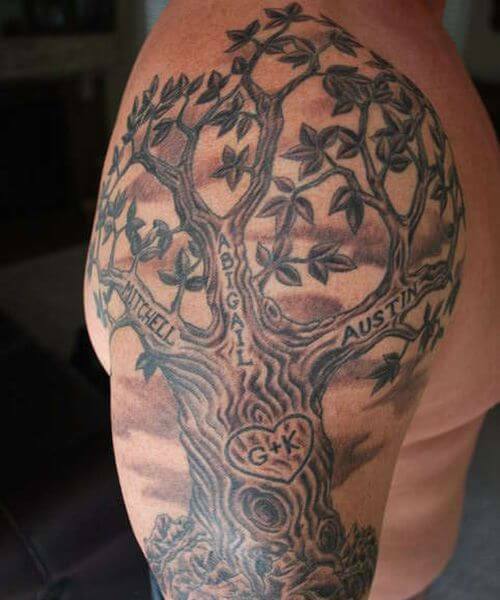 According to Fmag.com, family tree tattoo can be drawn on the body to reflect how important the family roots are to an individual. This type of tattoo also gives the individual the opportunity to break away from generic tattoo designs that have become commonplace. 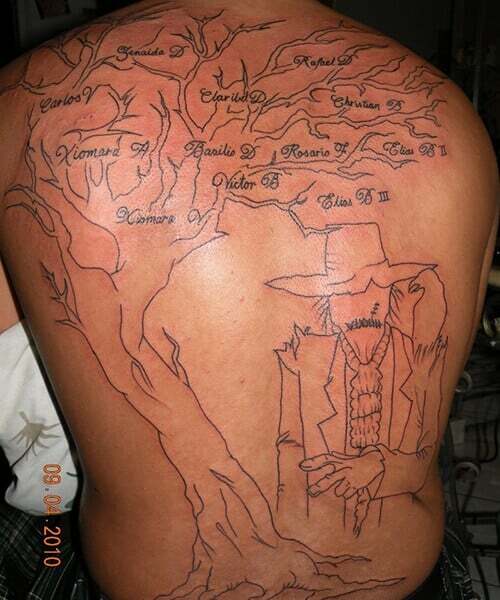 The most popular family tree tattoos for men features a black silhouette figure with a network of branches. Most men prefer designs that feature the names of family members or a simple inscription of the word family. 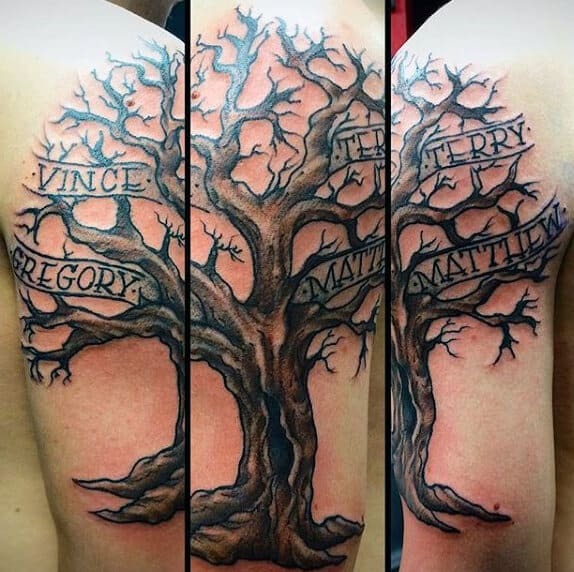 Why Are Men’s Family Tree Arts Popular? 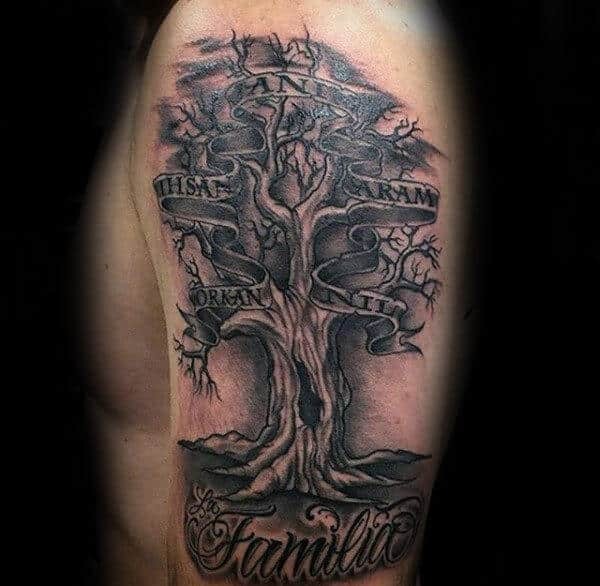 The family tree tattoos for men can be written on different parts of the body, mostly on the back, shoulder, and arms. 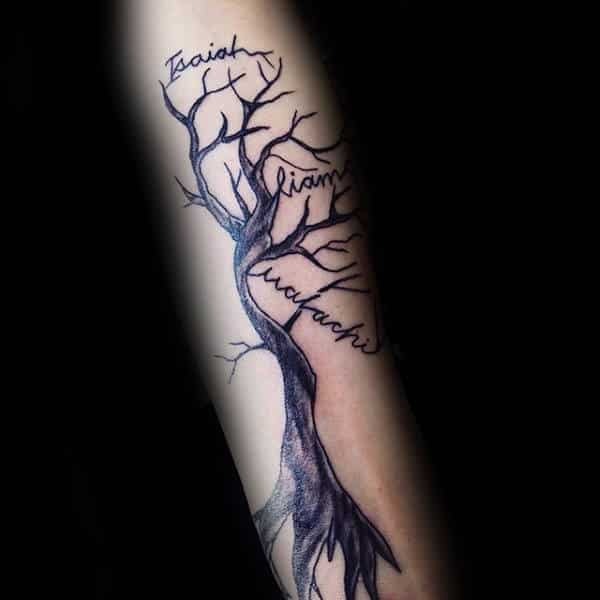 A tree tattoo beginning from the shoulder, moving into the far reaches of the forearm often symbolizes one’s strong connection to the past or a strong family foundation. 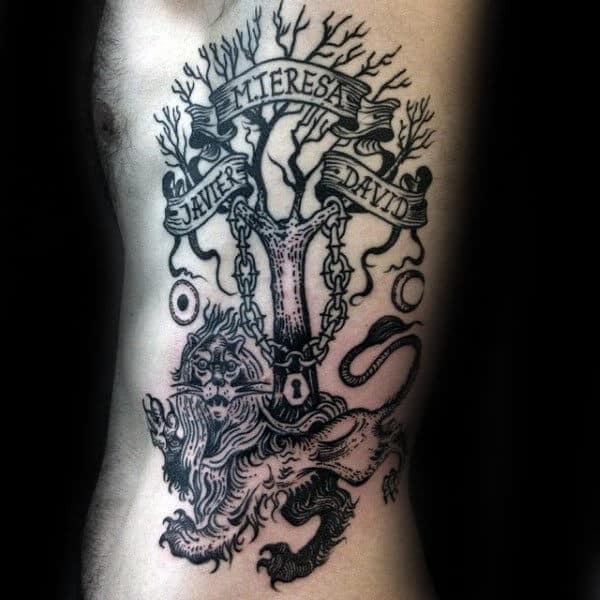 On the other hand, a tattoo design showing a naked, richly branched tree denotes an air of strength and self-sustenance. In the final analysis, the ubiquitous nature of tattoos, especially among men in the West is the reason tattoos have gained wide attention. It therefore comes as no surprise that about 25% of Americans in this day and age wear tattoos. For most men joining the fray, family tattoos help identify one with his social, cohorts and religious group. To most other people, a tattoo is a form or art and an expressive, protective symbol that you can gift your body. 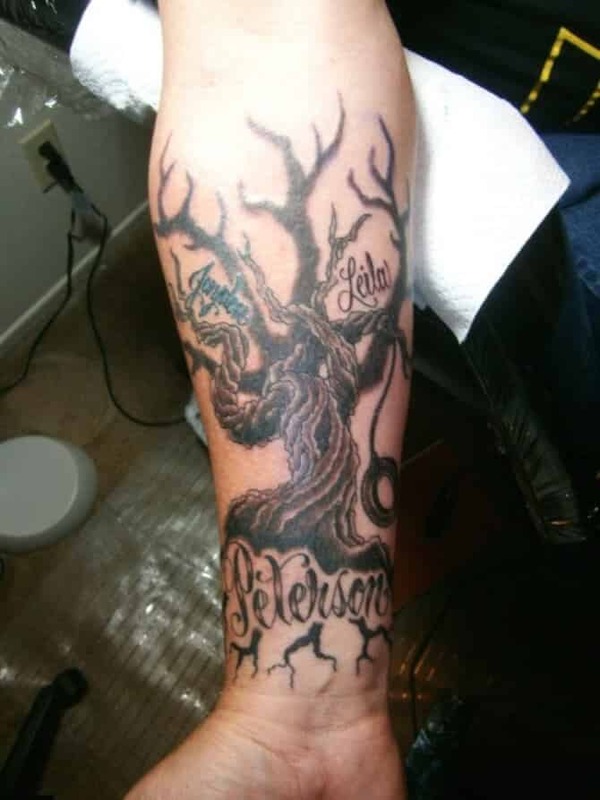 This tattoo features a bare tree with winding branches and several names in the top part of the tree. Each name has been written on a banner in black ink–which is mostly what this tattoo is composed of, with some brown. 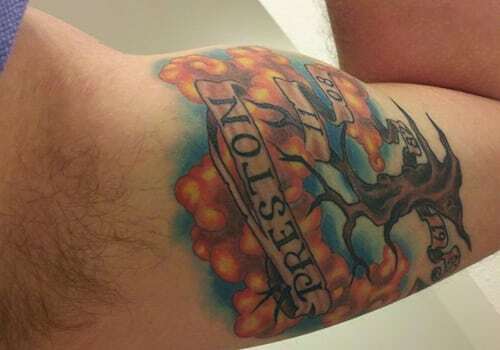 With the tree depicted on this tattoo, not only are there dark green leaves stemming from the branches, but the style of the tree is very smooth and wispy. The names are “carved” into the tree using a white ink. 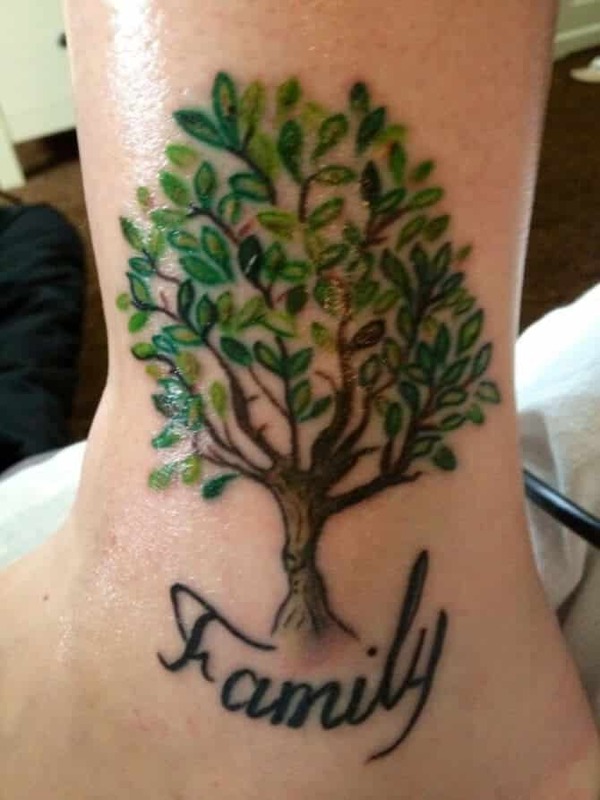 This family tree tattoo is very simple. 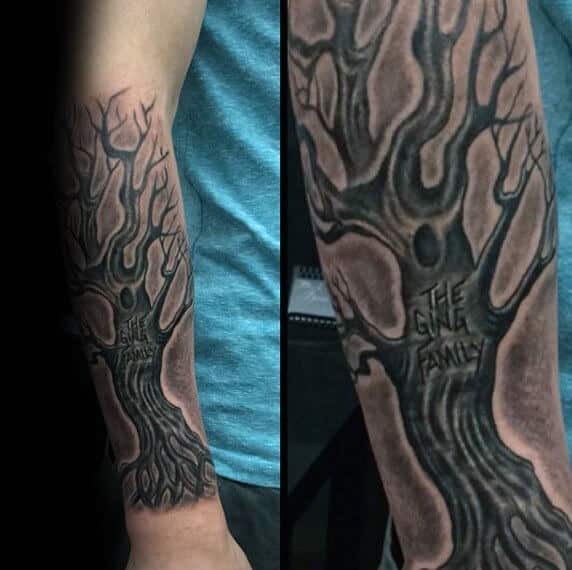 The tree is a single black outline and is composed equally of both branches and roots that stem the entire arm. The names are written in black ink on either the roots or branches. This black-and-white tattoo has a very medieval feel to it. Along the bottom of the bare tree is a lion stretched out, and the names–which are done on banners in the branches–are “locked on” with a chain and keyhole. 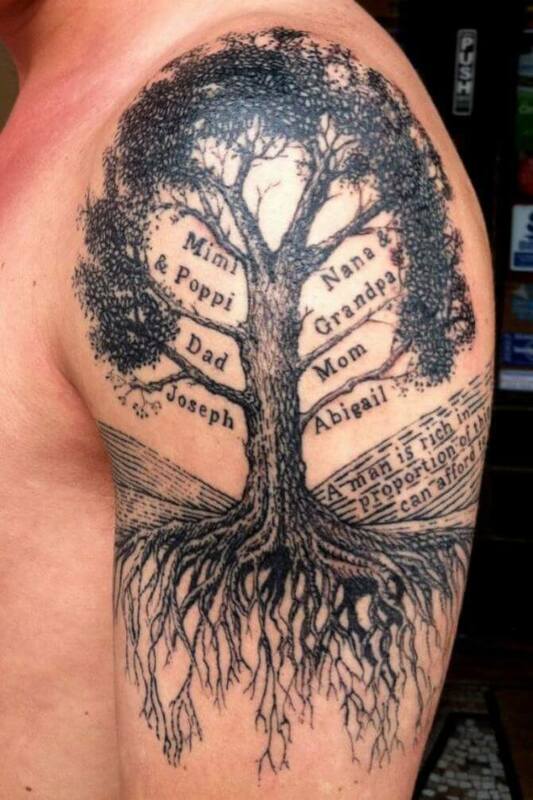 Of the family tree tattoos for men, this one is very detailed. In the purely black-and-white design, the tree is bare, and eyes can be seen peeking out from the inside. The names are banners that encircle the tree from branch to root. The tree is done in a black-and-white scheme and the branches of the tree have been replaced with the names of family members which, all together, make a heart shape. The tree is also built on a rock, or “solid foundation”. 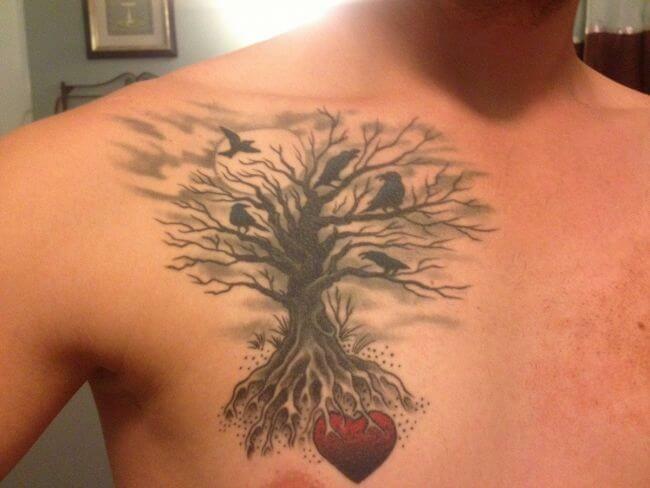 The tattoo only features the upper part of the tree, which is completely shaded in black-and-white ink. The names are large and cover certain aspects of the tree in a cursive script font. The tree itself is very bare and has only a few larger branches. The tree here is smaller and in black-and-white ink. The roots of the tree wind down into the veins of an anatomically correct human heart. The names are located in both the branches of the tree and the heart itself. The bare tree is shaded very heavily, and the names are on a banner that encircles the branches. 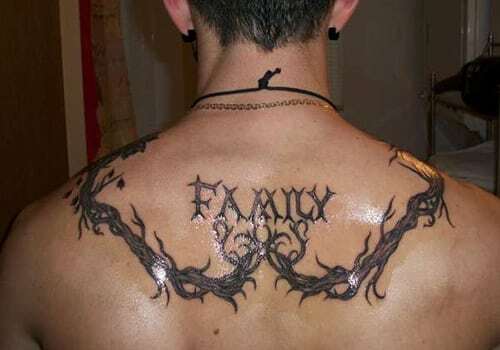 On the bottom in a large cursive font is the Latin word “familia” for “family” and the shading of the tattoo is done very darkly. 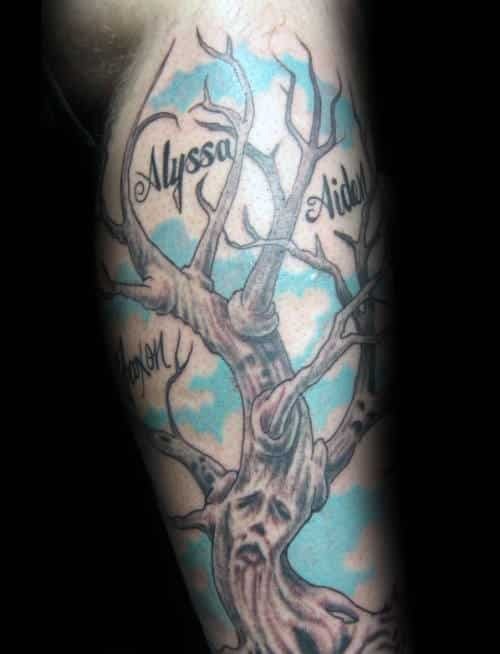 On this black-and-white tattoo, leaves are stemming from the branches of the tree, and clouds are floating in the background. Names are carved into the tree, and two initials, a plus sign, and a heart are carved into the center area. 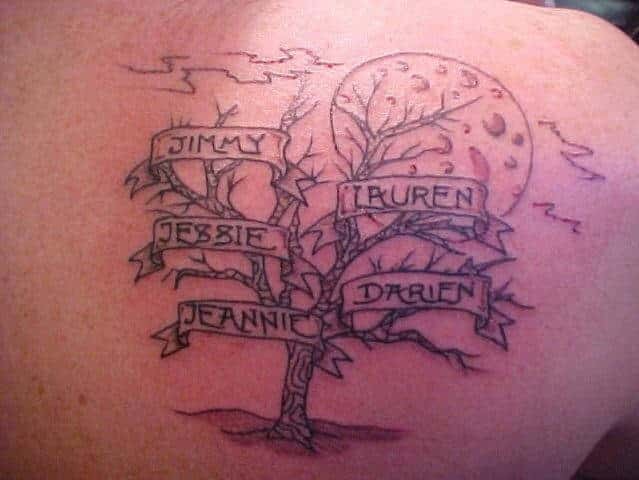 This family tree tattoo idea is a little smaller and simpler. Most of the tree has been shaded black, and the branches are spindly. The letters are almost “hidden” in the branches with the same kind of thin, black font. On this design, the lines of the tree are thick and very simple. The names are written on the sides and aren’t actually part of the tree itself. It’s enclosed in a circle, and at the bottom is the family name in large cursive. The tree in this image is very detailed and depicts almost an entire scene. The tree’s leaves are blowing in the wind, and all together make the word “family”. Not only are the roots shown, but the ground has also been shaded gray. The tree and its leaves are a simple design shaded gray and black. 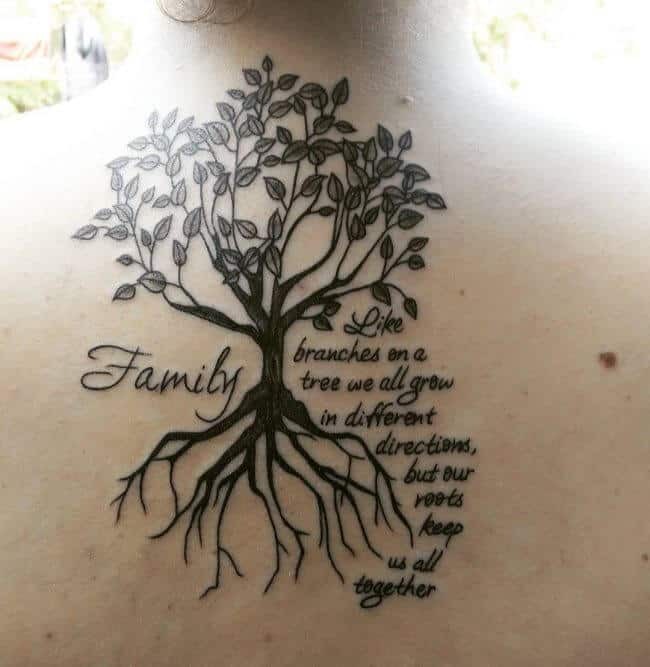 On the side is the word “family” and on the other side is a short poem that stretches down to the roots of the tree and signifies the togetherness of family. The tree is large and bare, with a lot of detail focused on the texture of the tree in a black-and-white color scheme. 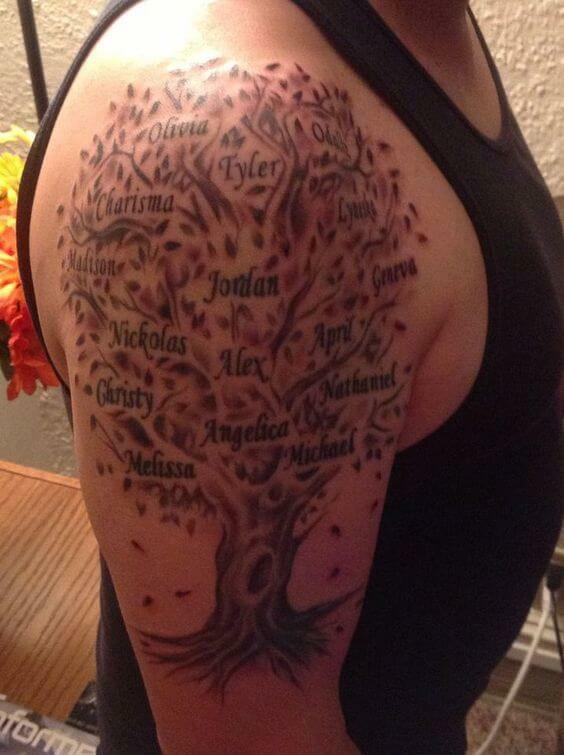 The names of family members have been placed in the blank spots between the branches in a smaller, cursive font. The branches of the tree in this design are detailed, but not shaded in. The trunk has been completely replaced with a large strand of DNA that winds down into the roots, and the DNA is designed to still have some tree-like texture to it. 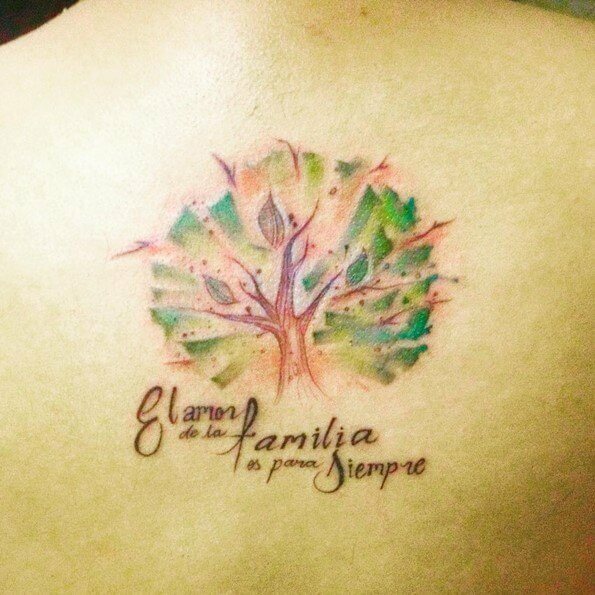 The brightly-colored family tattoo has a thick, brown tree and orange, circularly-shaped leaves coming off of it. 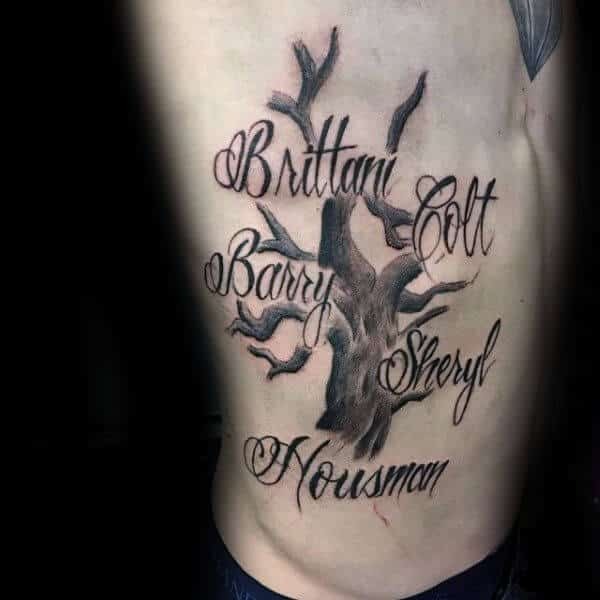 The family name is on a banner in the tree with various numbers, and the entire tattoo’s background is a clear blue sky. The black-and-white tree is bare here, but different faces can be seen hidden in the bark of the image. The names of family members are in between the branches, and a bright, blue sky is seen colored behind the tree. This brown and black tree is very textured with a carved in heart and initials in the trunk. The leaves are wispy and bunched together with pink ink–the names are written in black, cursive font on them–and no black outline. On the top of the tree is the word “Flower” written on a banner in the branches. The tree is done in black and white, and the banner extends to the roots of the tree with both specific names and dates on it. This bare tree is very textured and has a lot of dark shading. Not only is the tree dark, but the background has also been shaded gray as well. The only word in the image is the family name “carved” into the trunk of the tree. The black and white tree is bare, and gray clouds can be seen in the background. The highlight of the image are the black crows perched on the branches and the bright red heart that is attached to the roots. 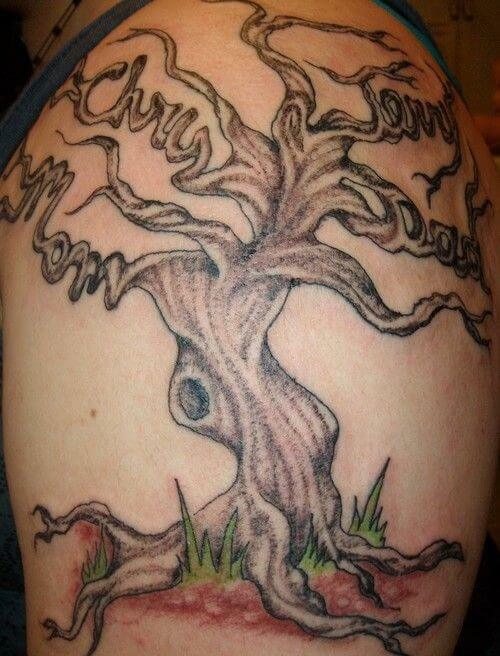 This large tattoo features a very windy, twisty tree with bare branches. Encircling the tree is a white banner with the different names of family members scrawled in black, cursive ink. The tattoo is wide, and takes up a significant portion of the arm. 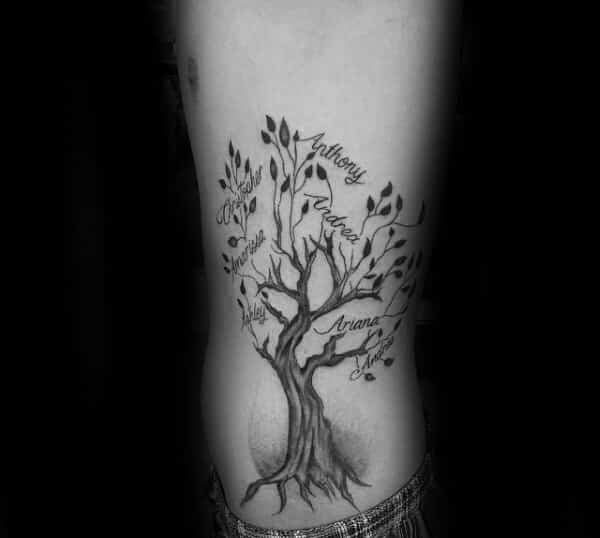 This multi-chrome family tree tattoo, sketched across the upper and middle back, features a beautiful tree with a sprawling canopy. 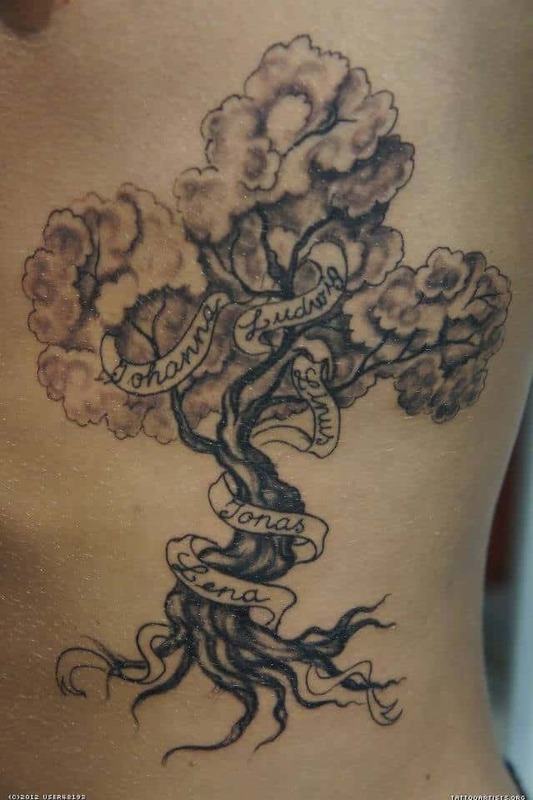 The branches of the tree incorporate the names of the members of your family. At the bottom, there is a lovely symmetrical design giving the impression of a flower pot. 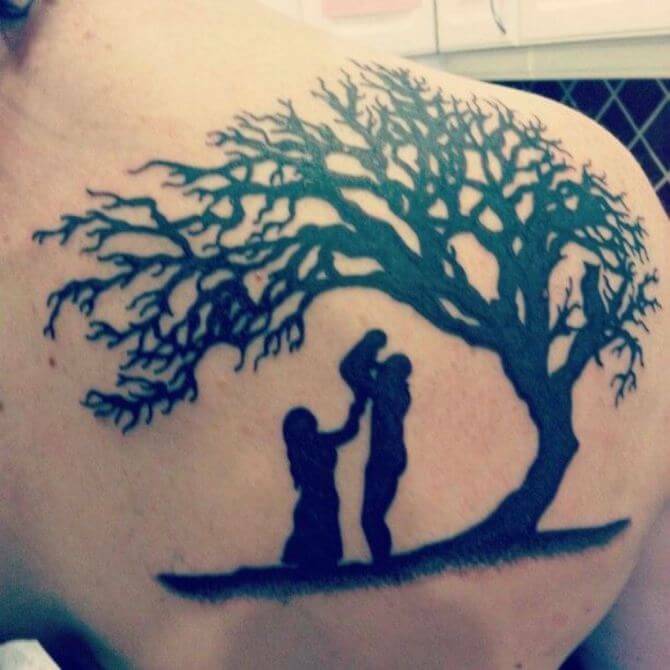 Those who have been on the hunt for perfect family tree tattoos, here’s a lovely design. 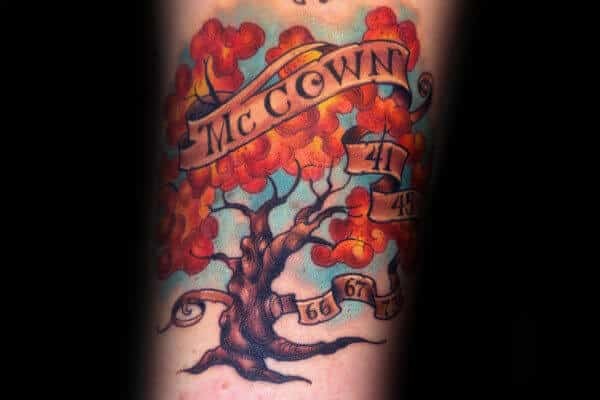 Sketched on the shoulder and upper arm, this multi-colored tattoo features a beautifully mature tree with a lush canopy. The dense network of branches and leaves make the perfect background to name the members of the family. 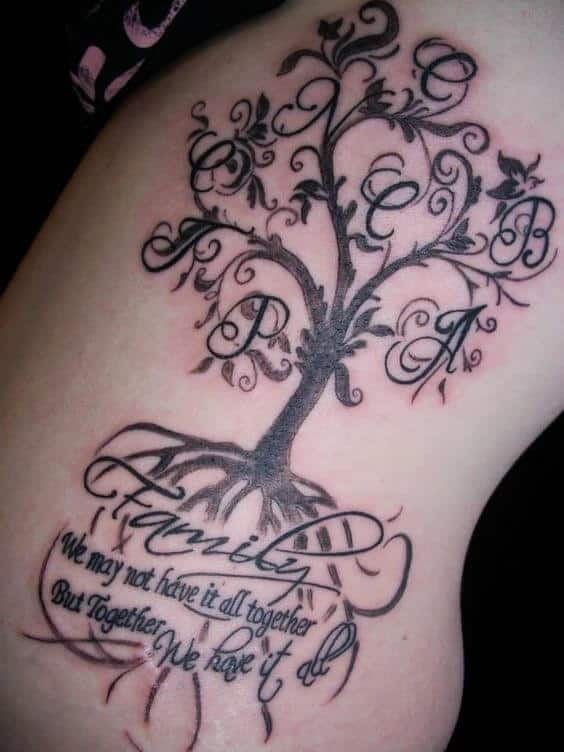 Here’s another intricate design for people looking for family tree tattoo ideas. 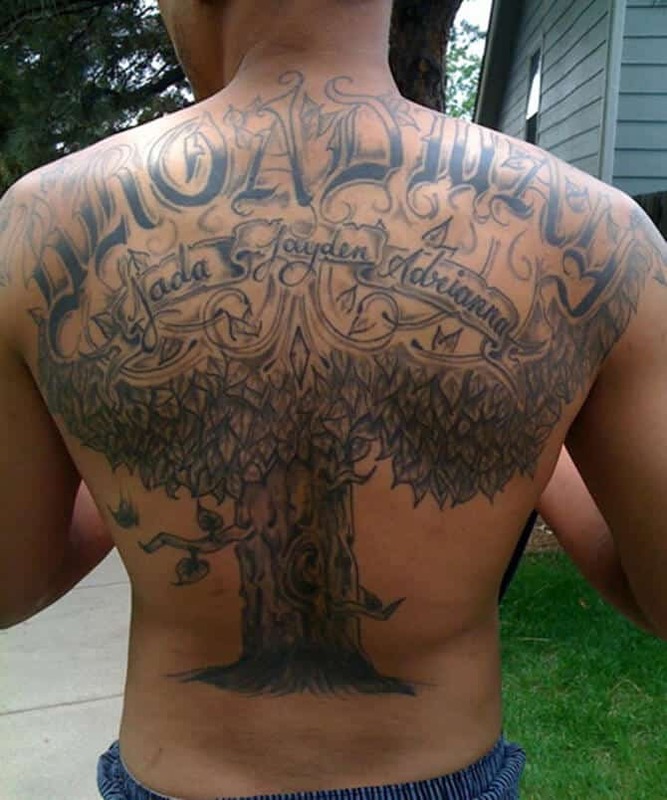 This large tattoo, sketched across the entire back, features a lovely tree against a rather stormy looking background. The little kid sitting at the base of the tree adds a truly captivating and haunting touch to the artwork. The tattoo also features a message etched in a lovely ancient looking font. 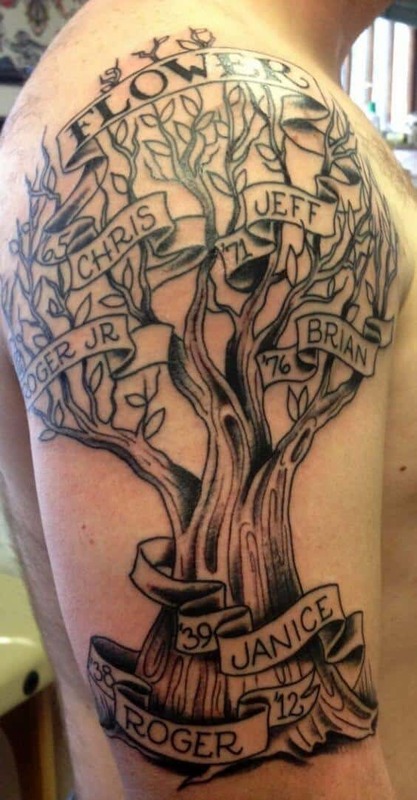 For those who are on the lookout for a family tree tattoos idea, here is another one to consider. This would especially appeal to those prefer their tattoo artwork to be small and discreet. 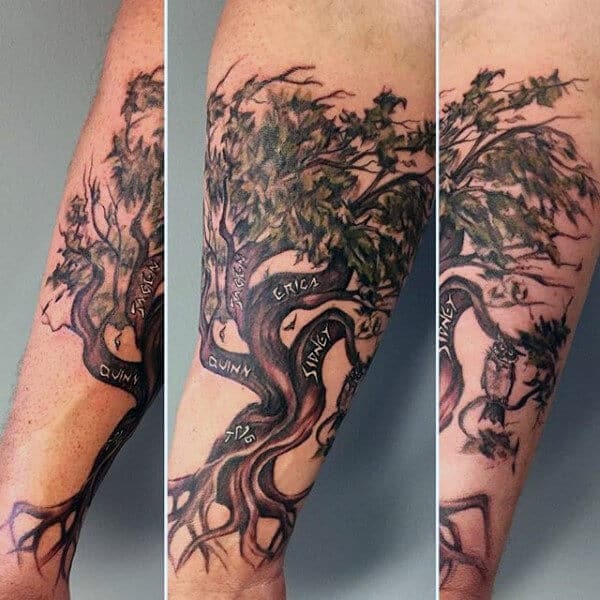 Sketched near the ankle region, this multi hued artwork features a beautiful tree with the word ‘family’ etched beneath the root. 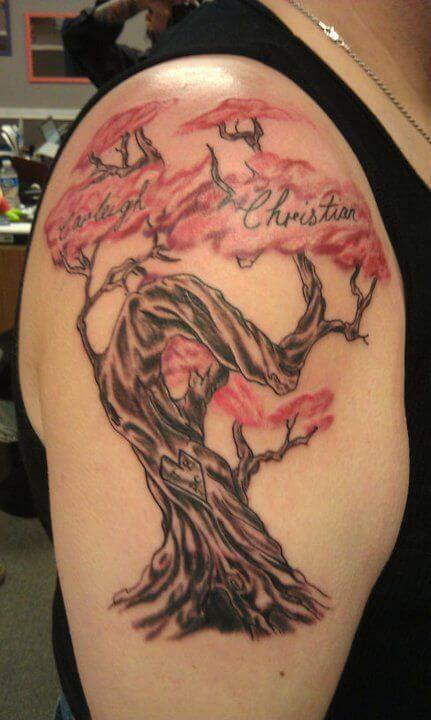 Here is a family tree tattoo design that would appeal to those with a taste for evocative artwork. this monochromatic masterpiece, sketched on the back, features a haunting looking tree in the winter with all its leaves gone. The dense network of branches creates a surreal effect. This intricate tattoo design, sketched on the upper arm region, features a tree in full bloom against a bluish background. The name of the family is etched on a ribbon that seems to flow across its bulbous canopy. Another ribbon like banner is sketched across the trunk with the year mentioned on it. 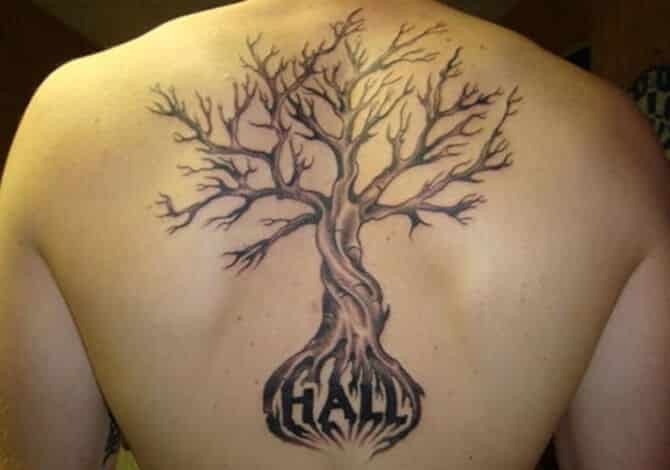 If you are looking for family tree tattoos for guys but want something different from the usual tree design, then this one might just interest you. 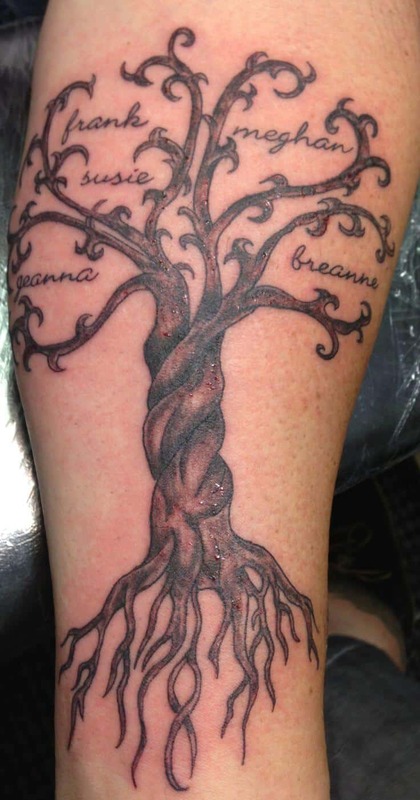 Sketched across the upper back region, this beautiful symmetrical tattoo features two branches interlocked together. 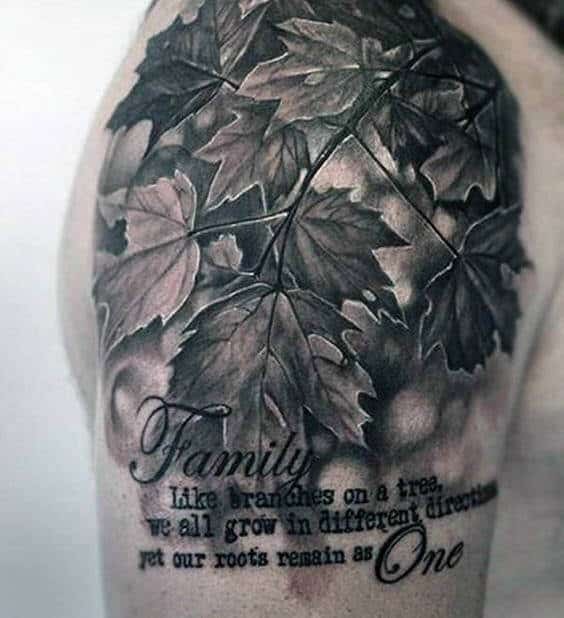 The word ‘family’ is positioned atop the point of intersection of branches. Here is a tattoo for those who like their artwork to be bold and big. This multi-colored design is sketched across the the side starting from the waist and up till the armpit region. 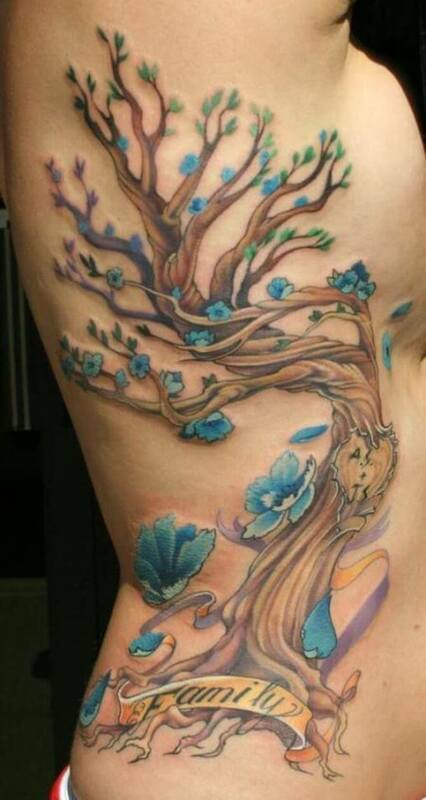 The artwork features a lovely twisting tree with a string of exquisite blue flowers. Beneath the root there is a banner featuring the word ‘family’. 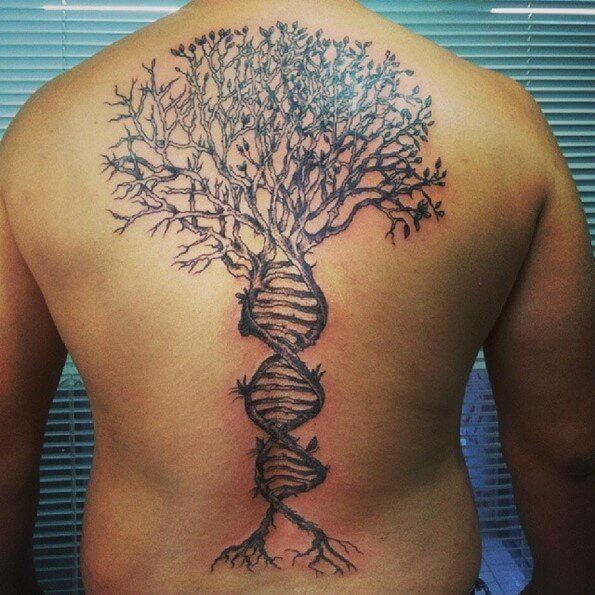 This mesmerizing family tree tattoo for men has an indescribable appeal that is bound to generate plenty of interest. 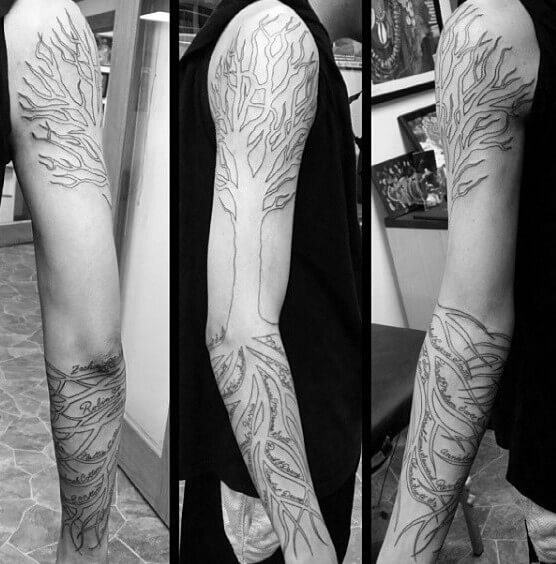 The monochrome artwork is sketched on the upper arm, featuring a hauntingly barren tree. 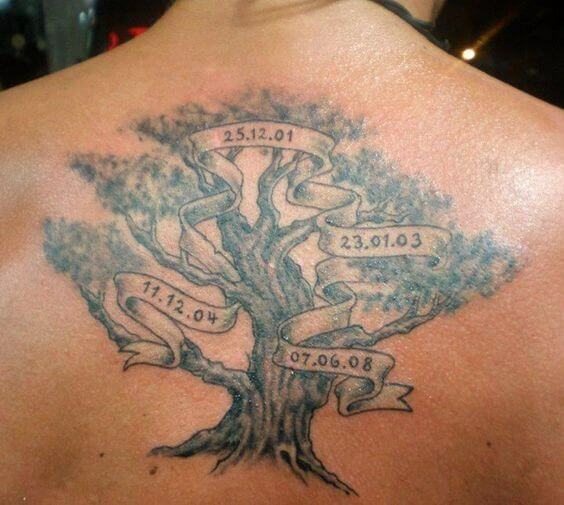 Each branch of the tree has the date, month and year of the birth of your family members etched over it. It also features a lovely quote on the side. This tattoo is for those who love nothing more than an intricate artwork that is rich in detail. 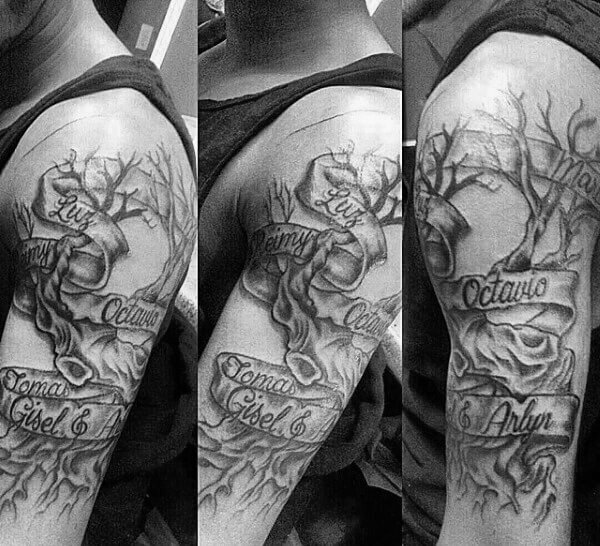 Sketched on the upper arm region, this monochrome artwork features a beautifully dense looking tree with each branch dedicated to members of your family. The rhizome structure of the root creates a truly stunning effect for this tattoo. If you have been thinking about tattoo ideas for men, then look no further. This monochrome artwork looks magnificent sketched on the upper arm region. The rich detail of the maple leaves, the mysterious dappling background, and the beautiful message etched at the bottom come together to create a truly one of a kind artwork. Here is another lovely monochromatic artwork that is sketched on the upper arm and shoulder region. The artwork features a rather stout looking tree, with a nice cavity in the trunk. 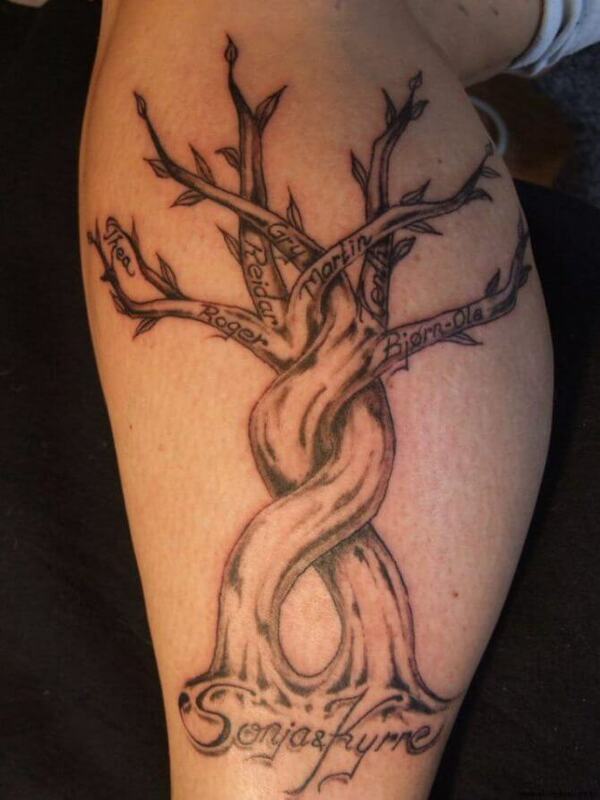 The initials of the family members are etched beside each of the branches while the root also features the initials of the patriarch and matriarch of the family. This beautifully intricate artwork create a true visual delight. 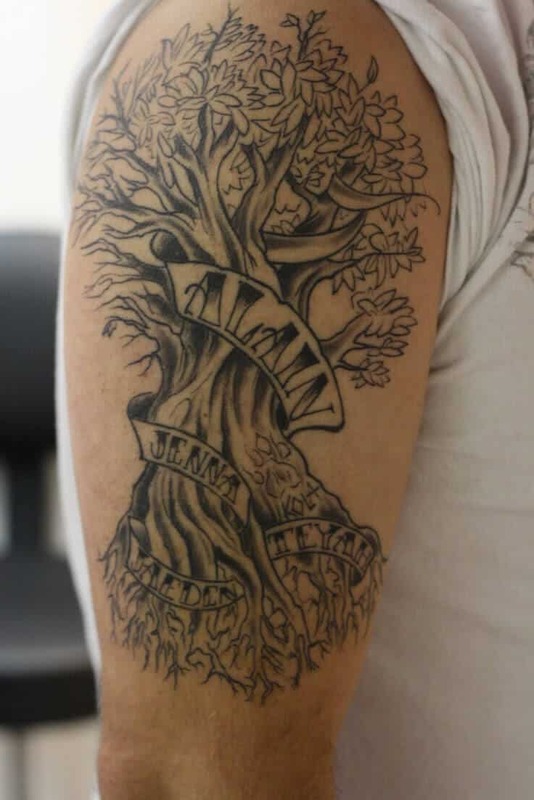 Sketched on the upper arm region, this masterpiece in monochrome features a rather old and stately looking tree with a sturdy and broad looking trunk. There’s a banner wrapped around the trunk featuring the name of the members of the family. Sketched on the forearm, this tattoo has a deceptively symmetrical quality about it. Each of the branches of the tree on this artwork have a name of the member of the family dedicated to them. The twisting form of the trunk and the rhizome like structure of the roots create a beautiful spectacle. People looking for some inspirational tattoos ideas can appreciate the craft and the genius of this artwork. Sketched on the leg below the knee, the tattoo features a two trunks of the same tree holding each other in an embrace. The branches on the tree features names of the family members. This tattoo is meant for people who prefer their artwork bold and large. Sketched across the entire back, this artwork in monochrome features an ancient and stately looking tree rich in detail and magnificence. The names of various members of the family are etched on banners that seem to flutter atop the dense canopy. If you have the urge for something different when it comes to family tree artwork, then this design is certain to pique your interest. 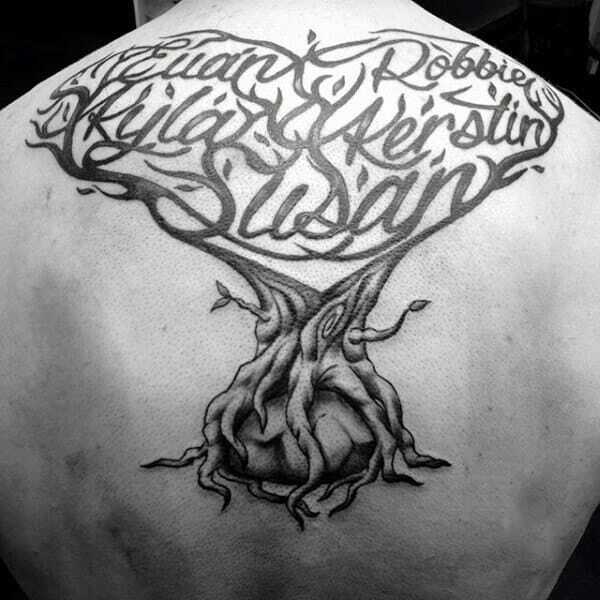 Sketched across the back, this monochromatic tattoo features a tree with the names of various members of the family. It also feature a gentleman in a tattered looking coat and a raven sitting atop his shoulder. Sketched on the back, this lovely tattoo has a very Gothic feel about it. The artwork features an ancient looking tree with its canopy in full bloom. There are lovely banners hanging and fluttering from the branches as well as one wrapped around the trunk, featuring the names of the family members. This lovely artwork is perfect for those who like their tattoos to be unobtrusive and discreet. 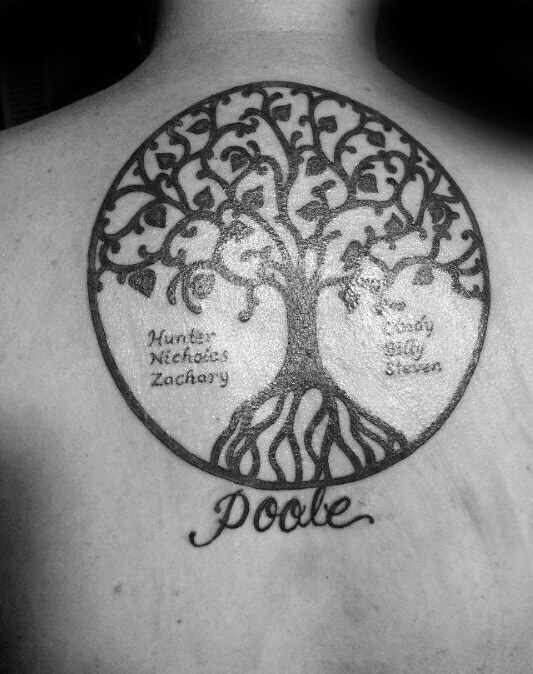 Sketched on the upper back region, this monochromatic beauty features a small tree with banners across its branches with the names of family members. Wafts of clouds and a rising moon adds to the appeal of the little masterpiece. 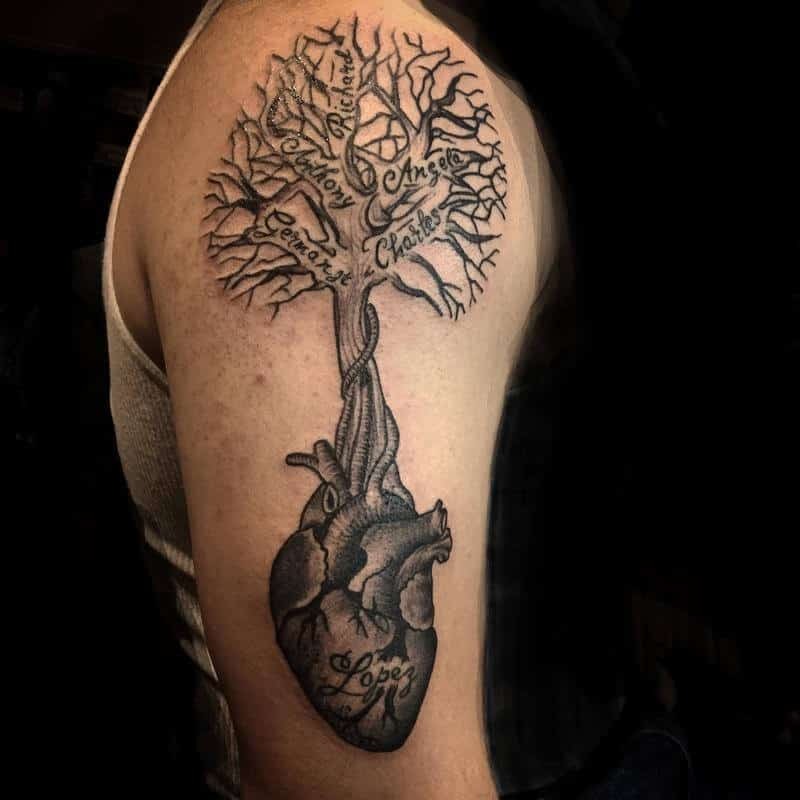 Sketched on the upper arm region, this artwork features a stout and ancient looking tree with a nice cavity in the trunk. 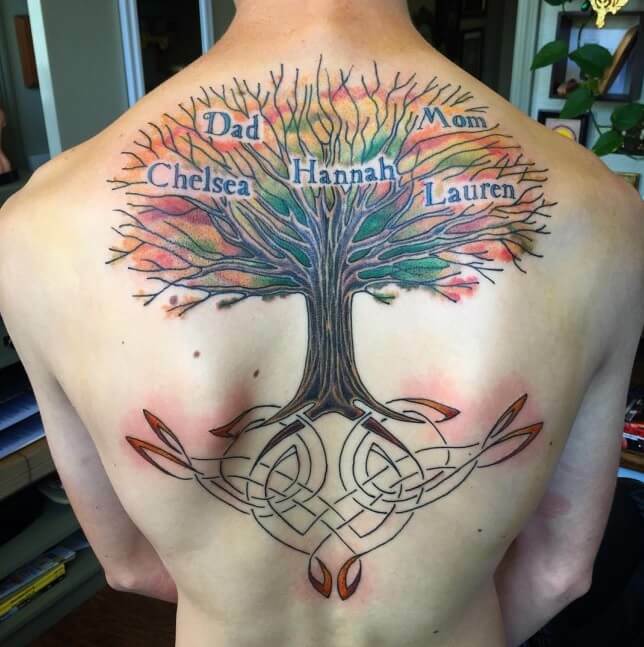 The unique appeal of the tattoo lies in how the branches are folded in a way so that names of the family members can be seen on each one. The green shoots at the base and the red soil create a nice appeal to this artwork. This tattoo stands out from the crowd on account of its simplicity and richness in detail. Sketched on the upper back region, the artwork in monochrome features an impressively ancient and stately looking tree with a rich foliage and canopy. A large banner weaves through the many branches mentioning the dates of birth of members of the family. Sketched on the forearm, this monochromatic artwork has a distinct Gothic appeal. The tree in this artwork rises above the ground in a twisting manner, with names of the family members scribbled above the branches. A distinct quality of this artwork is a swing made of tire hanging from one of the branches. A truly unique masterpiece. 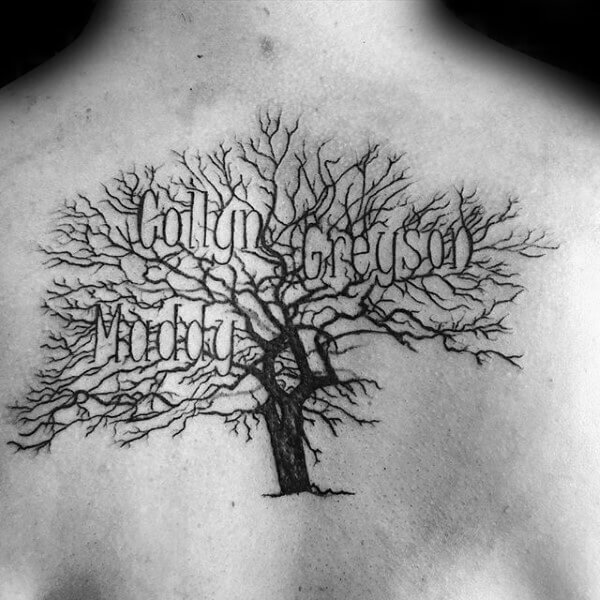 Sketched on the upper back region, this monochrome artwork features a haunting looking tree having shed all its leaves. The artwork further features a nice couple standing under the canopy of the tree, holding aloft their baby. The silhouette like quality of this artwork is truly mesmerizing. Here is another rather captivating looking artwork sketched across the forearm. The artwork, in monochrome, features a slim looking tree in the winter time when it has shed all its leaves. The branches of the tree have names of the family members dedicated to them. This impressively large artwork is charming and rich in detail. 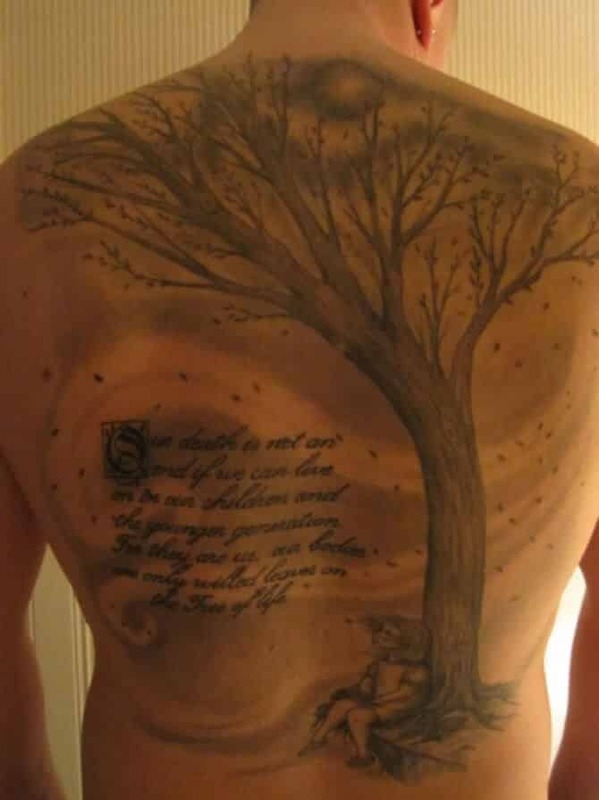 Sketched on the side of the person, the artwork features an impressive looking tree with a beautiful canopy and leaves. Names of the family members adorn the branches as if they were flowers.